and White Bean Soup with a Chive Gougère. 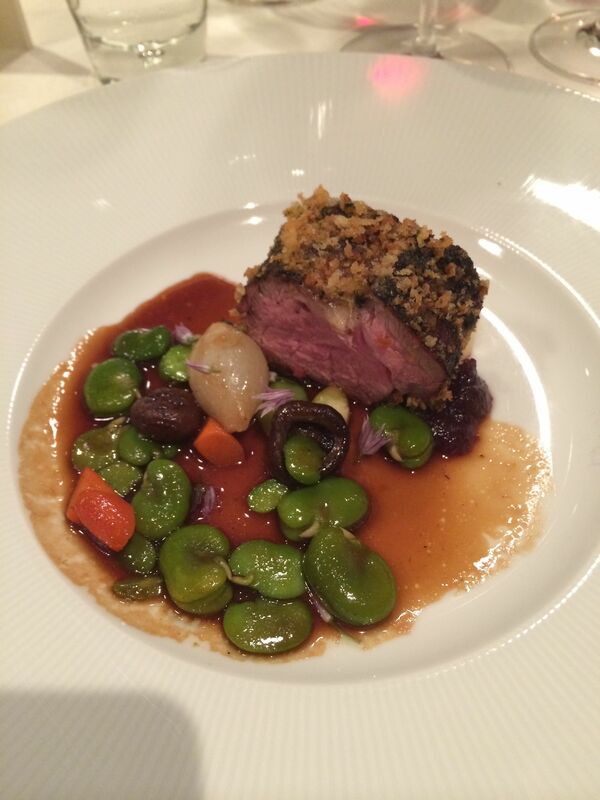 and the daughter had the Parsley-Crusted Loin of Jamison Farm’s Lamb with Green Lentils. It was indeed a meal that definitely celebrated dinner! I know we were just there in December, but our son wanted to celebrate his excellent report card with a dinner at the Inn, and who are we to say no to that? So off we went in mid-January to enjoy another scrumptious meal (and many congratulations regarding his academic performance). The kitchen was kind enough to provide an appetizer that wasn’t on the regular menu. It was a seared slice of toro (the fatty belly from the tuna) from Hawaii served with Asian greens and sprinkled with sesame seeds. “Seared” was perhaps a generous description (the kitchen might have waved it over the heat for a nanosecond or two), which is just how we like it. The toro melted in your mouth—it was an incredibly succulent mouthful. 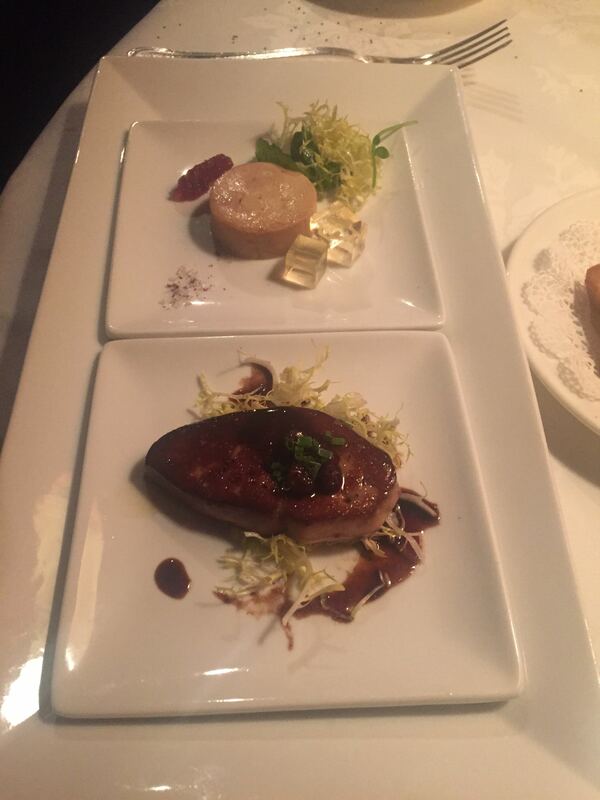 Next up for our son was seared foie gras–again, generously provided by the kitchen despite the fact that it wasn’t on the menu. This dish was evidently good enough for him not to share. 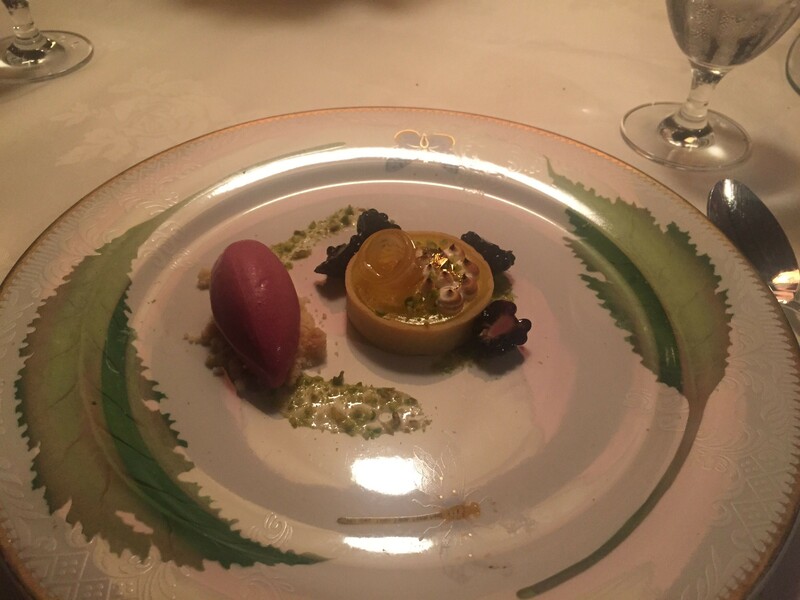 The remaining three members of the family had the golden egg filled with a mousse of foie gras and sauternes gelee. 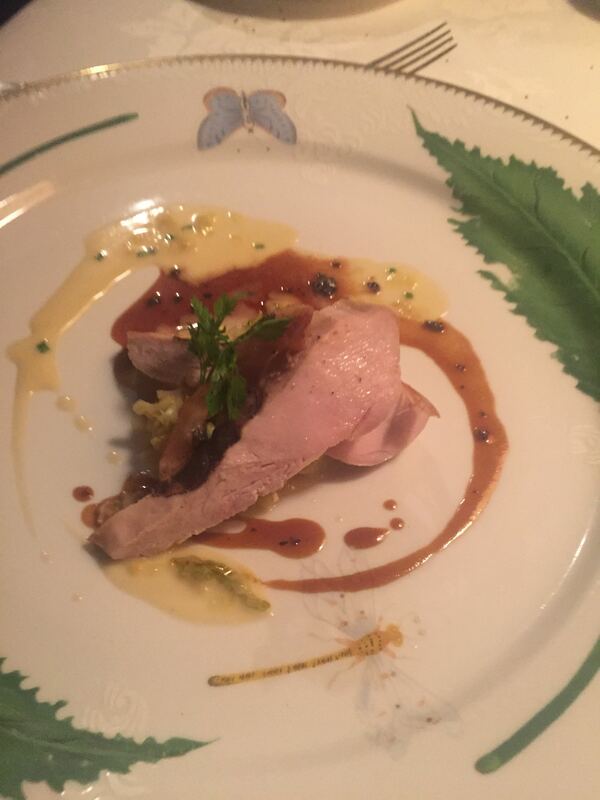 (The mousse is room temperature, which is why the son wasn’t a fan—he likes hot dishes for his meals.) However, none of the rest of us was complaining. 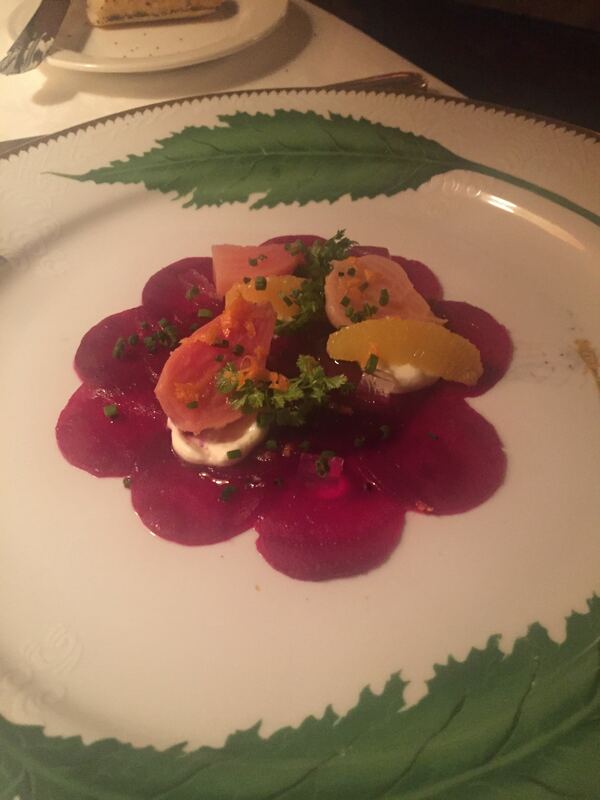 This is a relatively new dish on the Inn’s menu, and it is heavenly. Next up for the son was one of his favorite Inn dishes—macaroni and cheese done Inn-style. He was thrilled to see it back on the menu. The daughter and I had the pork cheek agnolotti bathed in uni butter. I hesitated about ordering this dish, as I do not like sea urchin AT ALL, but Jim encouraged me to get it, and I’m glad he did. The uni provided a subtle flavor to the veal cheek, and the sauce was, of course, delectable. Jim, on the other hand, ordered one of his favorite dishes—the tin of sin. Osetra caviar on top of a crab rillettes and served with a side of brioche. For caviar lovers, this is a must try. For entrees, three of us had the short rib of bison with local mustard greens and gremolata. The daughter chose the cauliflower “steak” with yellow Indian curry. 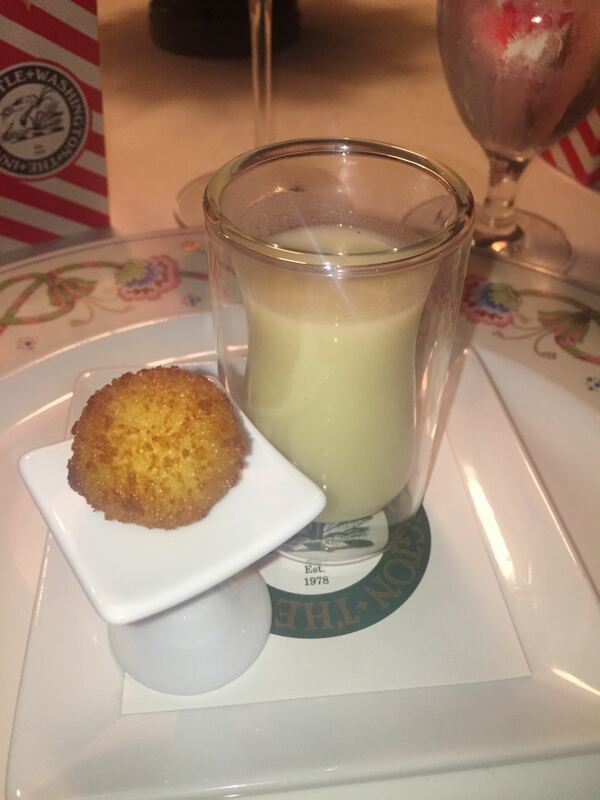 As we paused for breath (and stomach room), we were served with a palate cleanser of the Inn’s version of the orange creamsicle in a dish of shortbread crumbs. And then came the desserts. The congratulatory dessert was mint chocolate chip ice cream accompanied by chocolate ribbons. The daughter chose a lemon meringue tartlet. 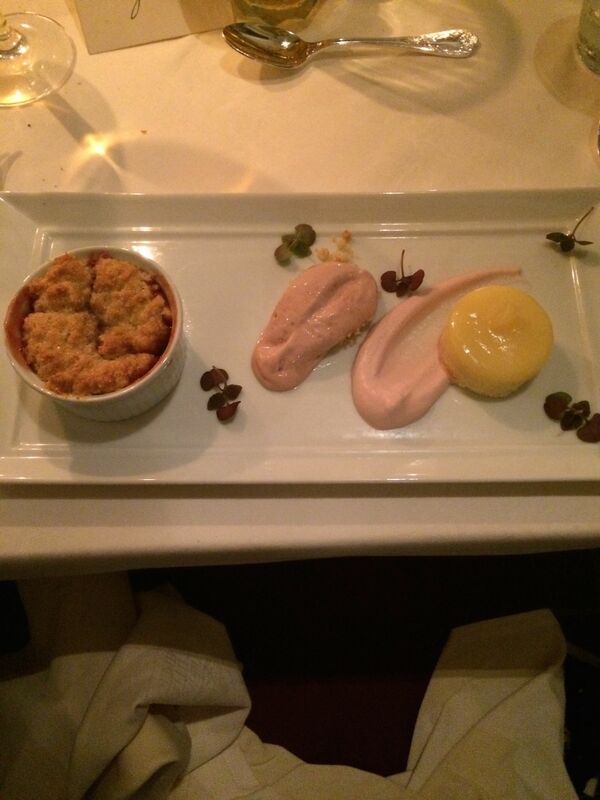 Jim chose the classic Inn dessert of the Seven Deadly Sins. 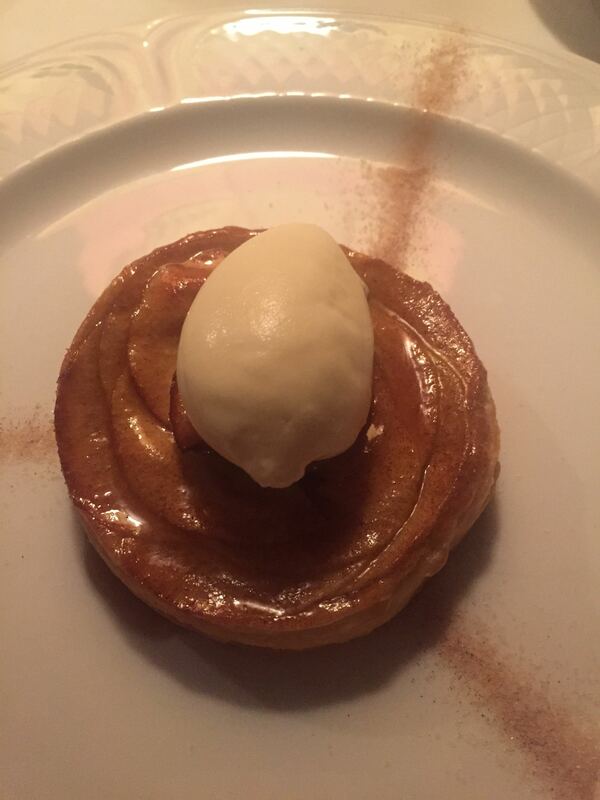 And I had my standby of the Granny Smith Apple Tart. We emerged from the dinner with all of our taste buds enjoying their food coma. Another fabulous dinner at the Inn! The Inn is located at the intersection of Middle and Main Street, Washington, Virgnia. You can find out more about the Inn at www.theinnatlittlewashington.com. The menu has changed a bit since I last blogged about a meal there, so I thought I’d take you through what we had last night. We started, of course, with one of my favorite dishes there—truffle popcorn. You will never want to have movie theatre popcorn again after having this. The popcorn is tossed with some herbs and spices, but the whole point of this popcorn is that it is topped with shaved black truffle. Yummmmmmm…..
the world’s smallest baked potato topped with caviar, “chips & dip,” cucumber rillettes topped with fish roe, and a red wine risotto ball. 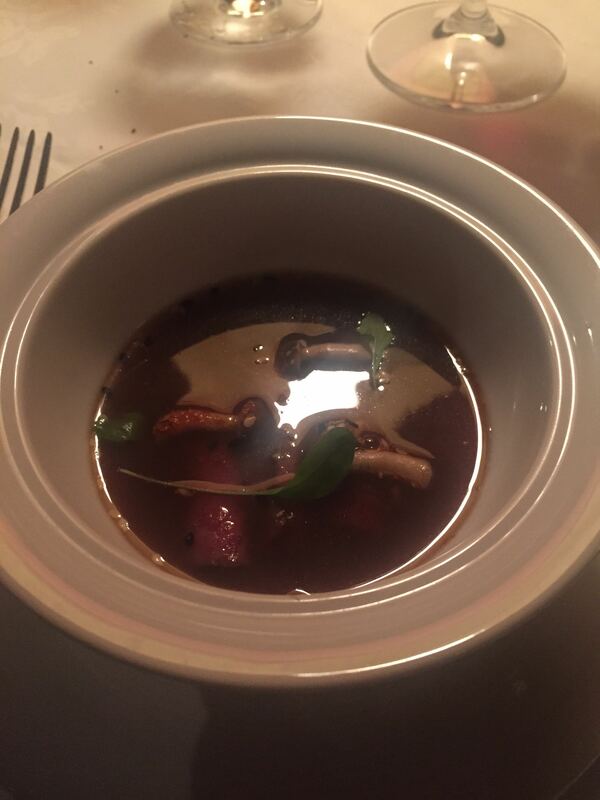 Next up was a pheasant consommé accompanied by a chive gougère. The consommé was simply unbelievably fabulous and went onto my list of all-time favorite dishes (it’s a long list with a lot of Inn dishes on it). An old favorite of the Inn’s was resurrected and reformulated–fire and ice, which is now seared tuna served with watermelon radishes in a sesame-ginger sauce and topped with cucumber sorbet. It was like welcoming back an old friend. 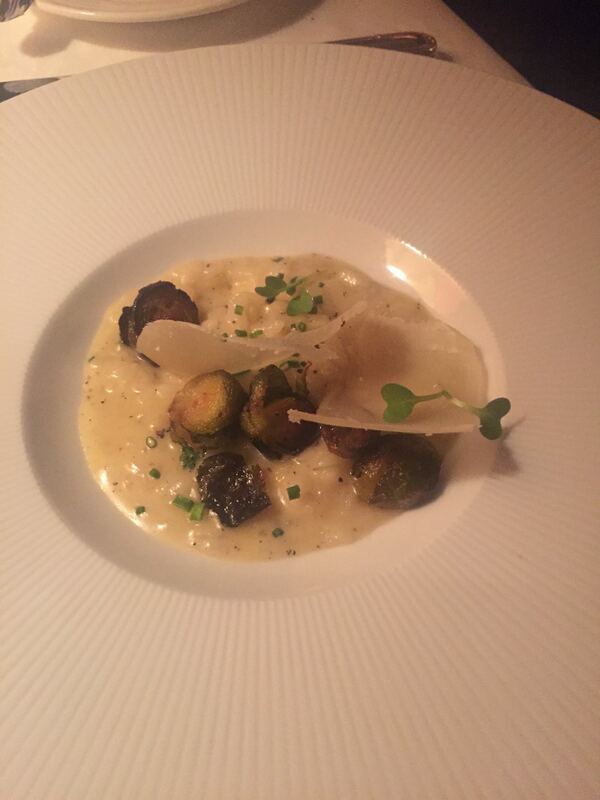 I then had a raviolo of spinach topped with—you guessed it—white Alba truffles. Delectable (and so good for you, too!). Jim had sweet-and-sour diver’s scallops accompanied by a shisito pepper. The sweet-and-sour was restrained and elegant, and the shisito pepper gave the dish a nice contrasting flavor (or so I’m told, I didn’t get a bite of that). The final “entrée” was a short rib of bison that had been cooking for 14 hours, served with mustard greens and topped with homemade onion rings. The slight bitterness of the mustard greens went well with the richness of the bison and the slightly sweet onion rings. 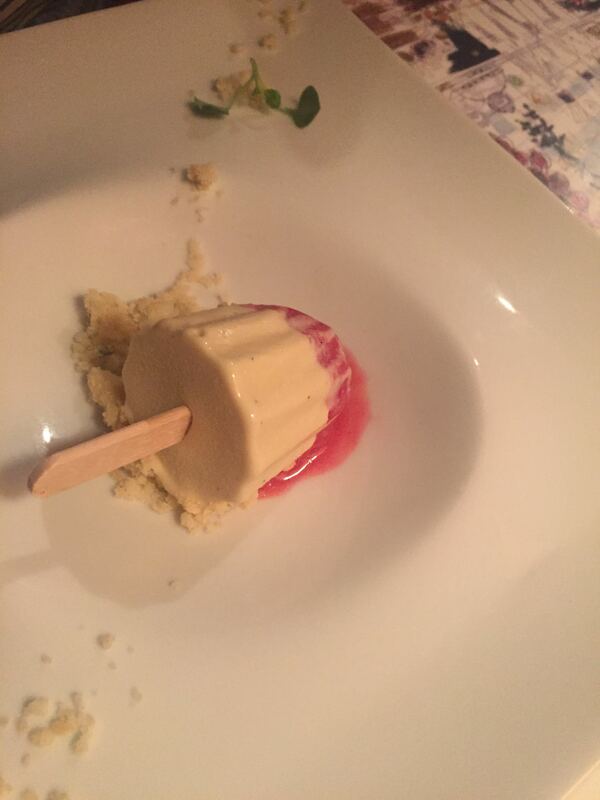 The palate cleanser was the Inn’s version of a dreamsicle accompanied with crumbs of shortbread. And finally (not pictured) was a Granny Smith apple tart (for me) and a visit by Faira the Cow and Cameron the cheese maestro (for Jim). 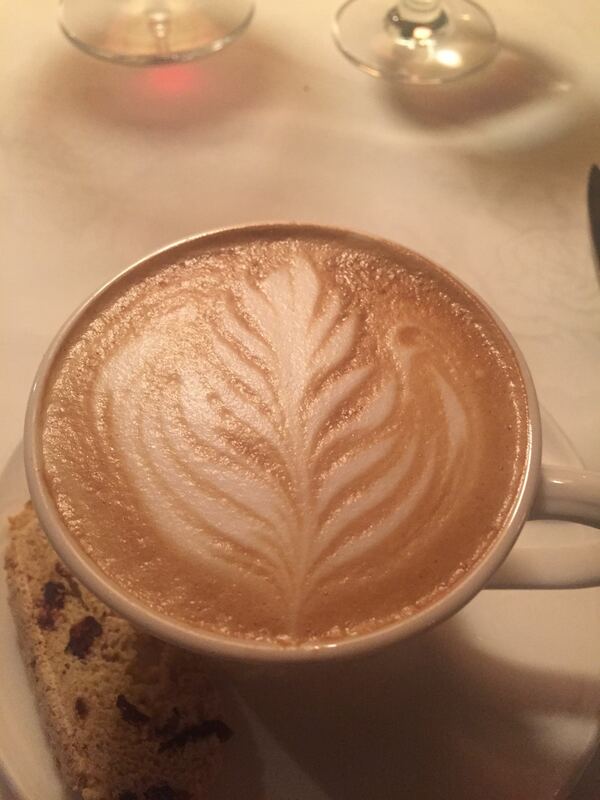 And the beautiful cappuccino accompanied by a slice of biscotti. The Inn was, of course, still decorated for the holidays, with festively decorated trees and garlands and holiday lights. It was a wonderful way to bring the year to an end! Naturally, we had a lovely dinner. The Inn has changed its format somewhat and now offers three different tasting menus, including an excellent vegetarian one. You can swap out items between tasting menus to suit your own tastes. 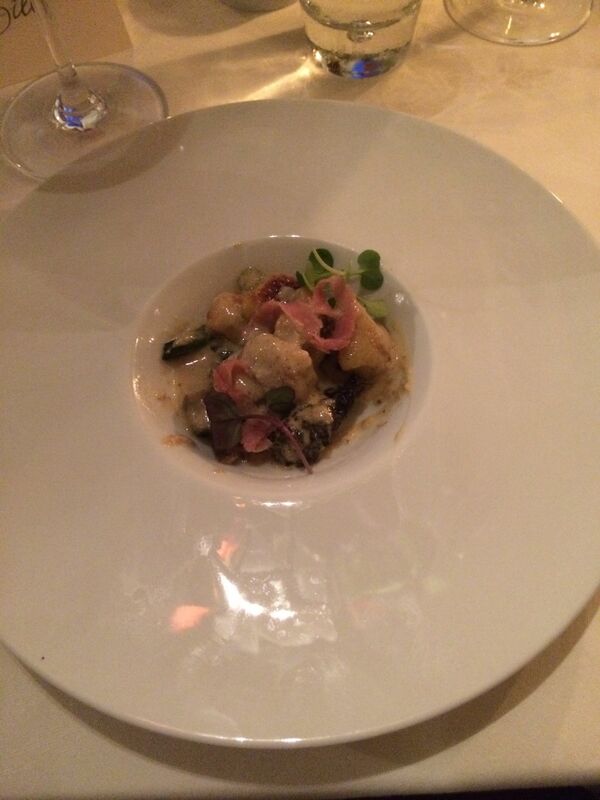 The portions are small, to suit a tasting menu. Much as we don’t particularly like change, we like this change very much. It matches well to our inclination to taste as many different dishes as possible, you can customize the menu, and you don’t feel uncomfortably stuffed at the end of the meal. It’s perfect for us. 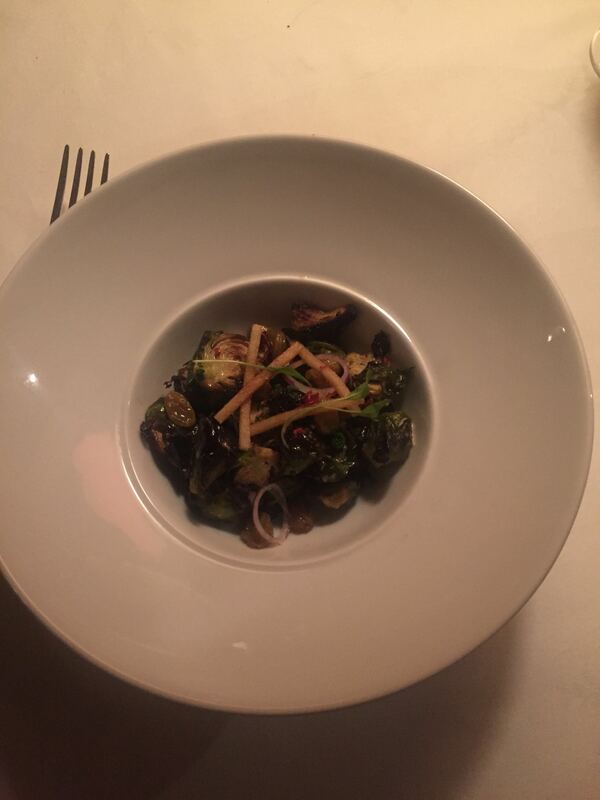 At almost every meal we have there, we start with some off-the-menu appetizers, and I never remember to record them. This time, I did! 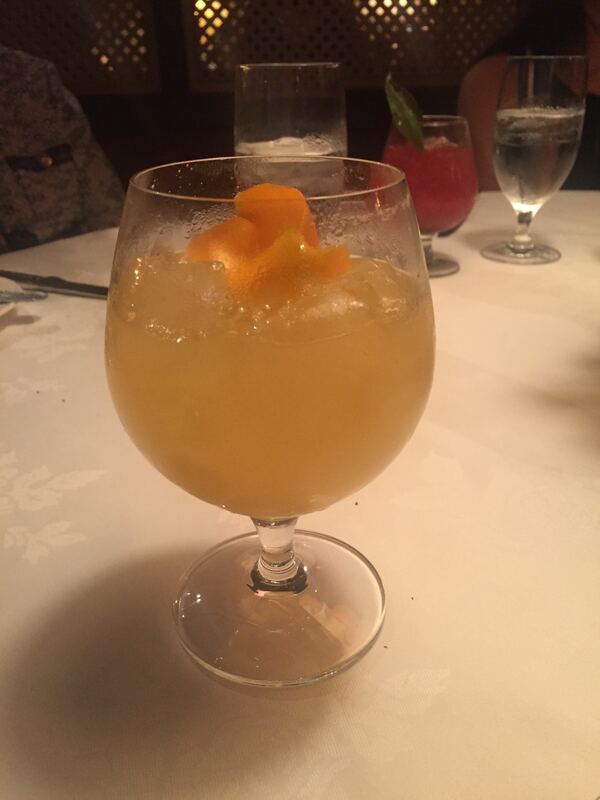 To start out, there is a new bartender at the Inn who does an amazing job with non-alcoholic drinks. This is only one example of the many concoctions he came up with that evening. They are sophisticated and delicious and worth trying, especially if you are the designated driver. This is the one time you won’t be sorry to be limited to non-alcoholic drinks! 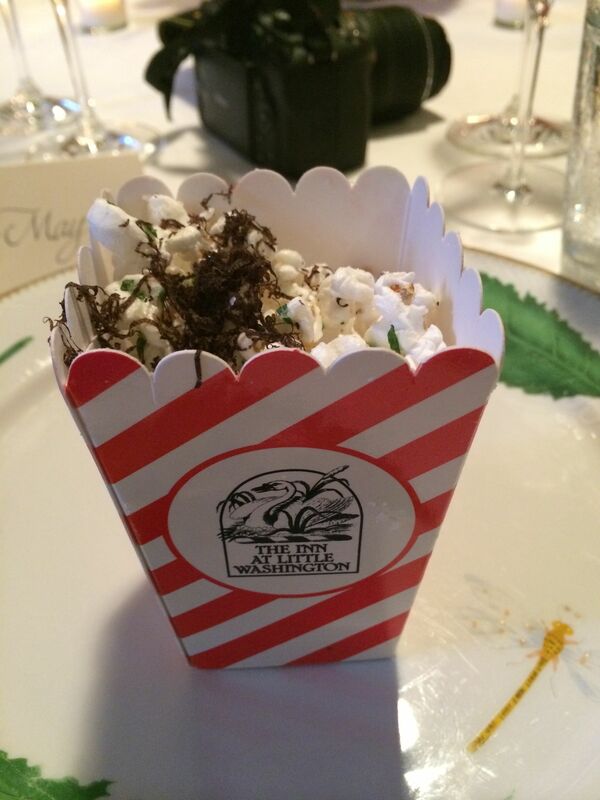 Truffle popcorn is one of my favorite dishes at the Inn. 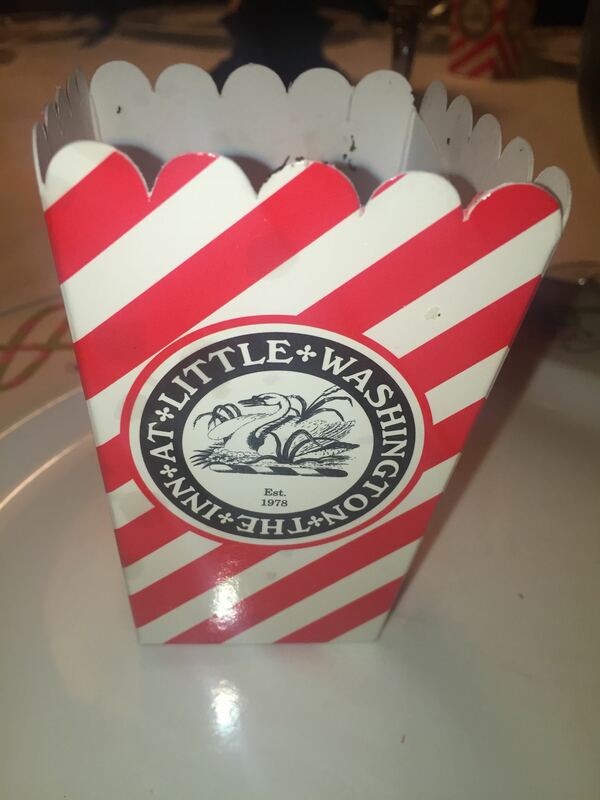 This is no ordinary popcorn. It’s been tossed with a variety of spices and a little butter. But the crowning glory is that as the popcorn is being served, a generous amount of black truffle is shaved on top of it. I could eat nothing but a giant bowl of truffle popcorn and still consider the meal to be one of my favorite meals at the Inn! 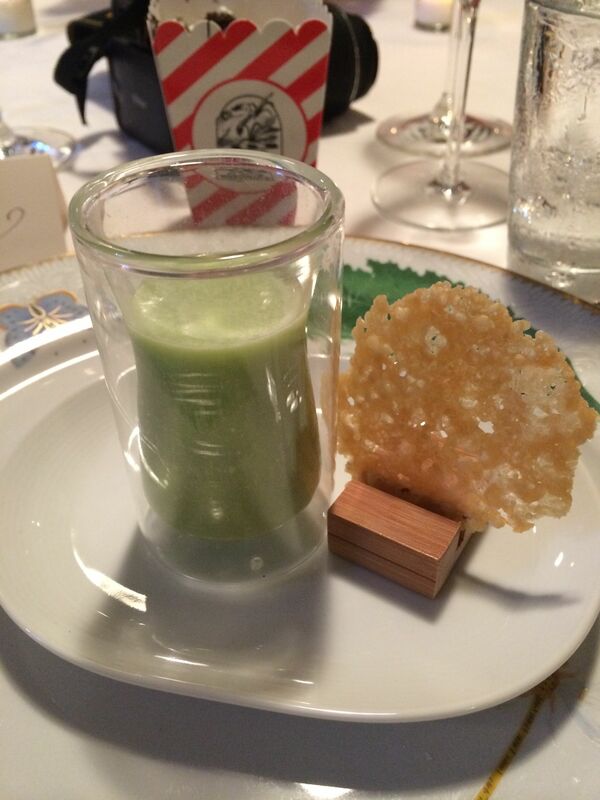 The tasting menu starts with a shot of soup. For some, it was a white bean truffle soup and for others, it was apple rutabaga soup. 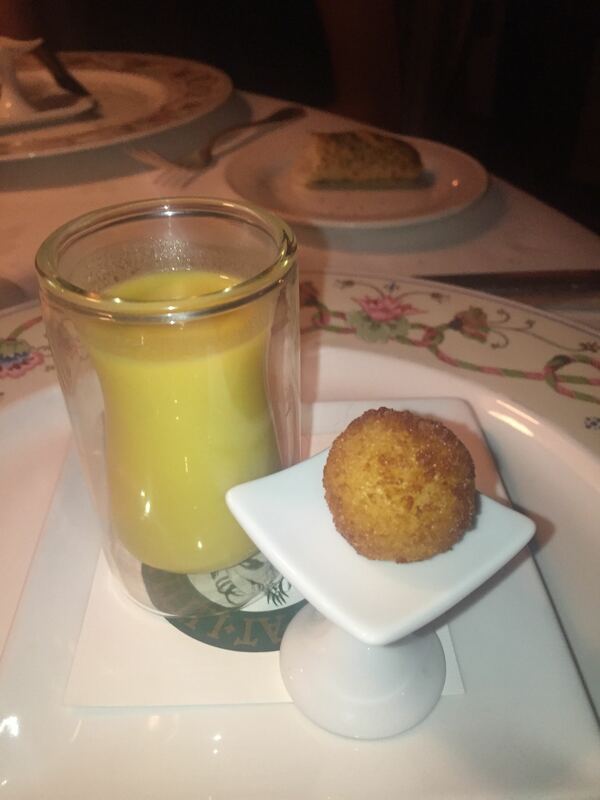 Both soups are served with a fried risotto ball on the side. My preference was the white bean truffle soup as the apple rutabaga soup was a bit sweet for me, but that was definitely not a unanimous opinion. 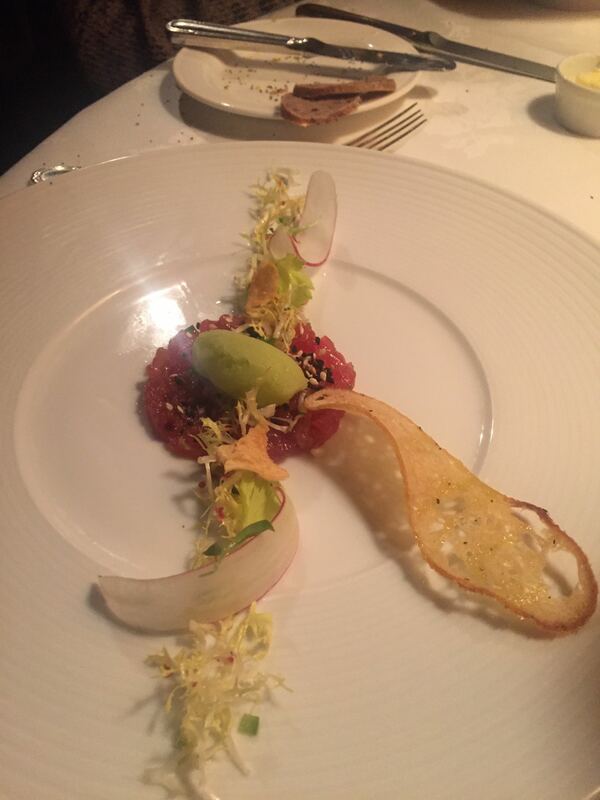 There are two raw fish dishes being served on the current menu. 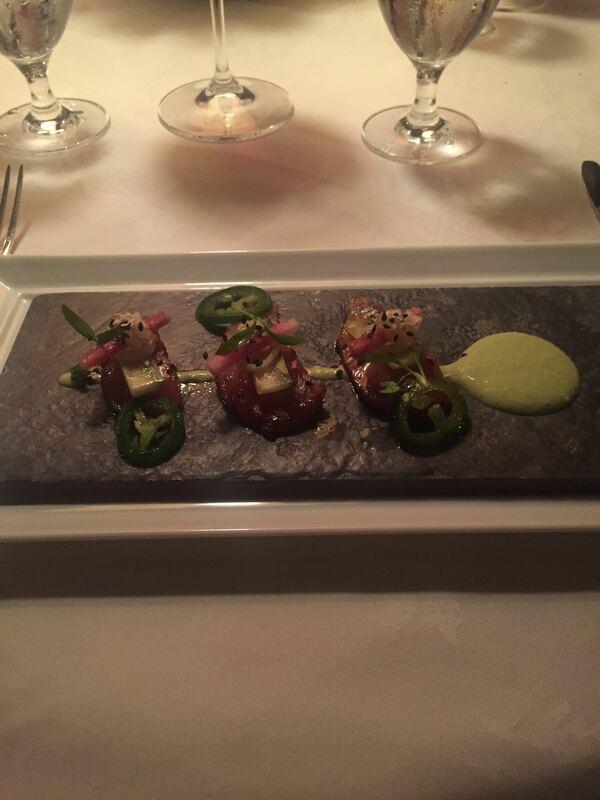 The first is a sashimi of Japanese yellowtail served with jalapeno peppers and dusted with espelette. 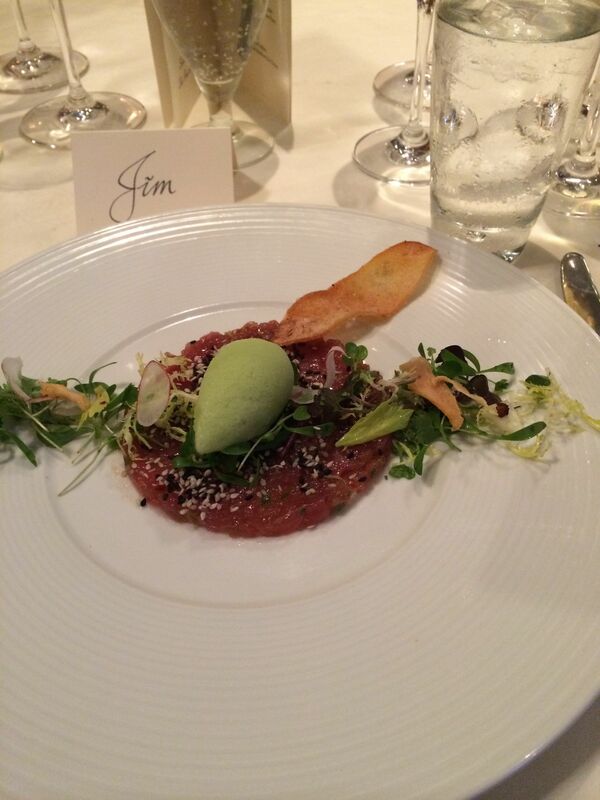 The second is ahi tuna tartare served with cucumber sorbet. Both are spectacular, and the quality of the fish is superb. The best new item on the menu is a thinly shaved Australian wagyu beef “shabu-shabu.” The beef is beyond tender, and the shabu-shabu broth has a bite to it that is both unexpected and leaves you wanting more. 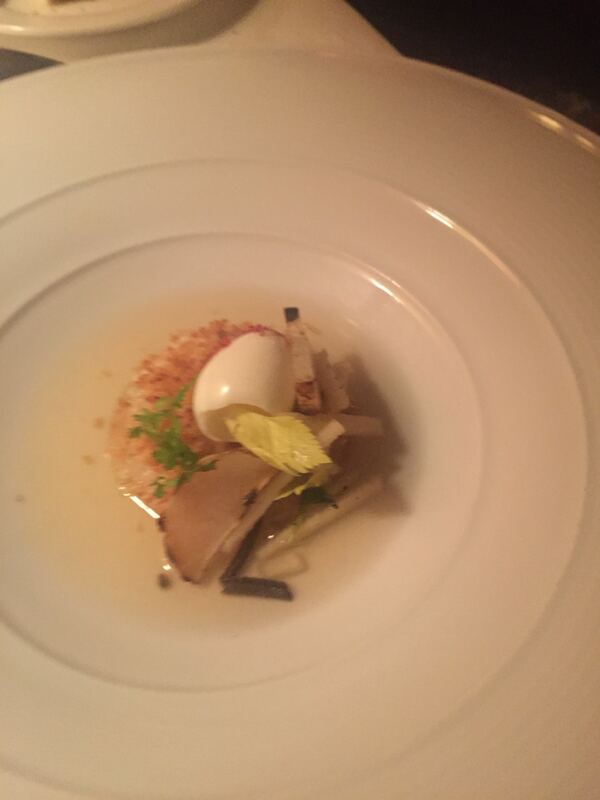 The vegetarian equivalent is a winter turnip gratin with a quail egg and parmesan broth. 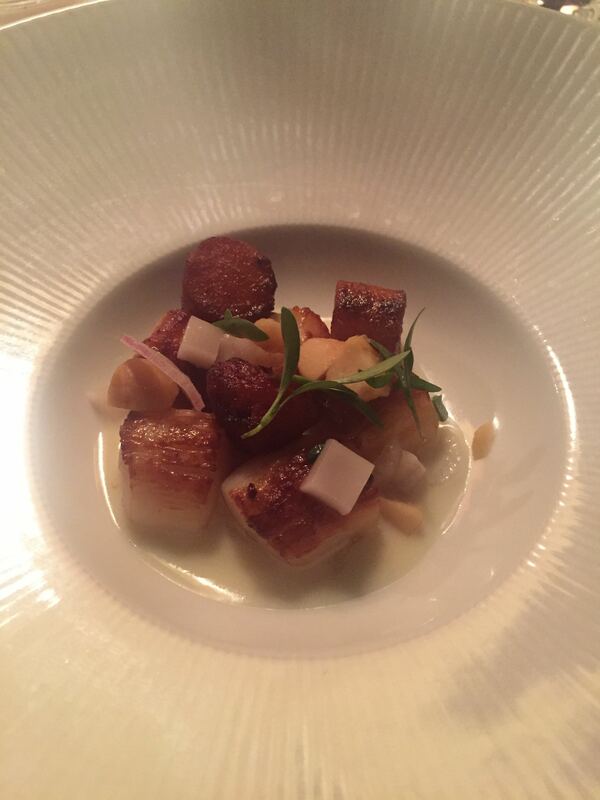 This is a sweet New England bay scallops dish served with candied yams and young coconut. A bit on the sweet side for me with the yams, but the scallops were delicate and wonderful. 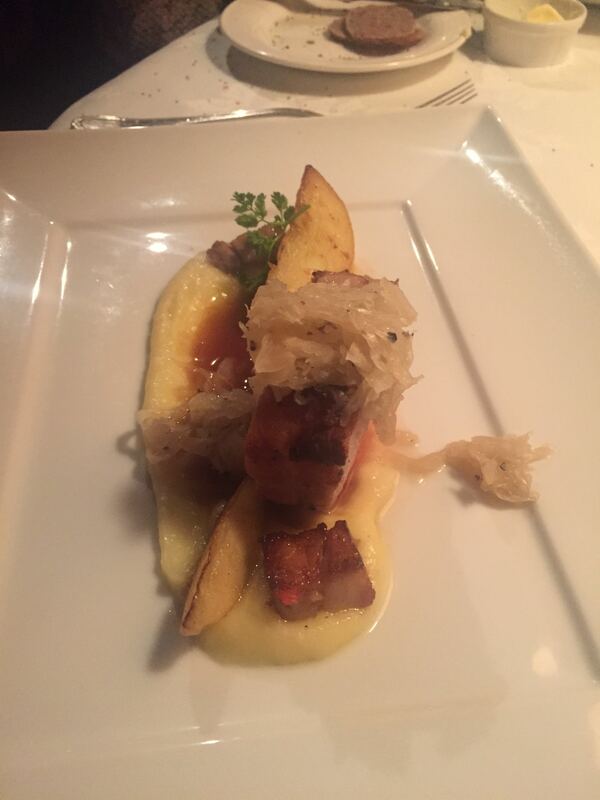 The “meat” entrees included a pork chop with sauerkraut braised in Virginia Riesling, local apples and potato purée. 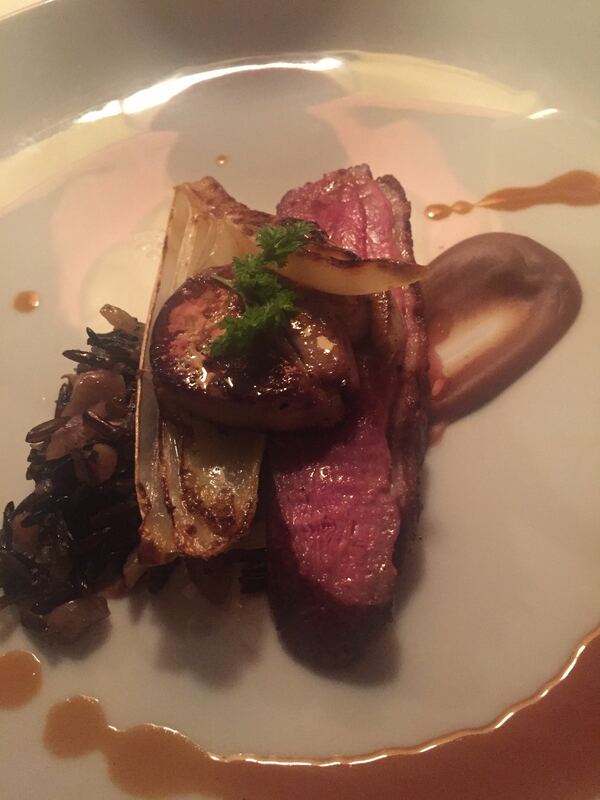 Duck breast served with foie gras and endive and wild rice. 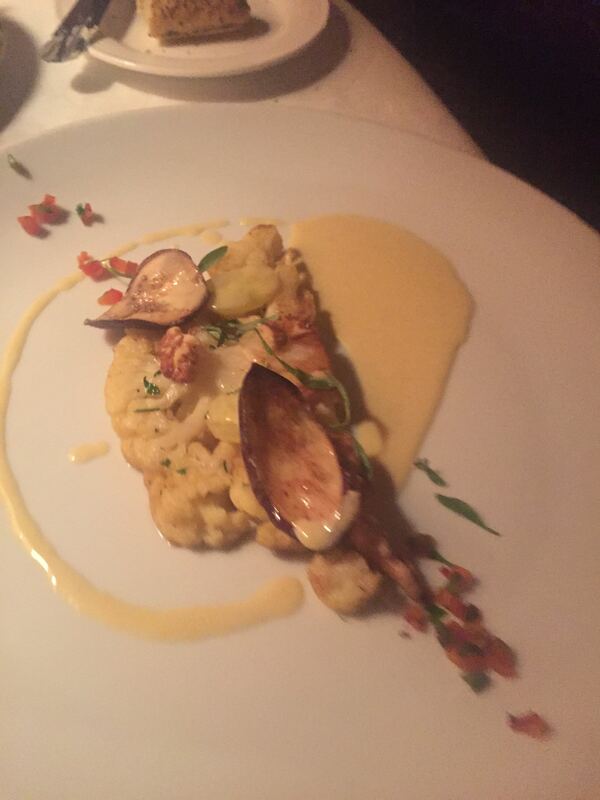 And a cauliflower “steak” with yellow Indian curry, green grapes and candied walnuts. 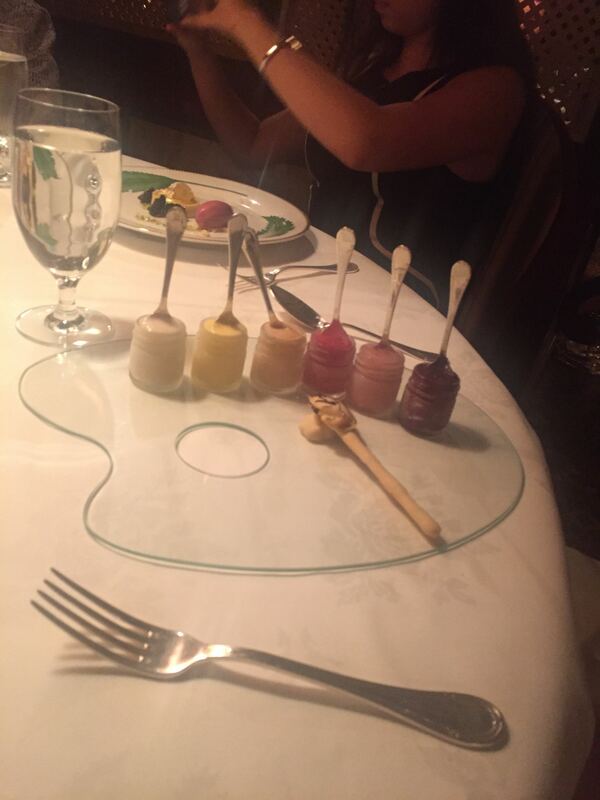 As a palate cleanser, we were served a cranberry orange sorbet and hickory ice cream popsicle. A lovely way to celebrate the end of the year!